Kick off your visit on the 6th (Fri): don't miss a visit to Fruit's Square (Trg Brace Radic) and then admire the striking features of Cathedral and Bell Tower of St. Domnius. For traveler tips, photos, ratings, and other tourist information, use the Split trip planner . London, UK to Split is an approximately 6-hour flight. You can also do a combination of train, bus, and flight; or do a combination of car and ferry. You'll lose 1 hour traveling from London to Split due to the time zone difference. Traveling from London in September, things will get somewhat warmer in Split: highs are around 30°C and lows about 19°C. Finish your sightseeing early on the 7th (Sat) to allow enough time to take a bus to Dubrovnik. Start off your visit on the 8th (Sun): step off the mainland to explore Island of Lokrum and then take a stroll through Old Town. Here are some ideas for day two: explore the ancient world of Walls of Dubrovnik, then make a trip to Upper Corner Tower Foundry Museum, then get engrossed in the history at Rector's Palace, and finally see the interesting displays at War Photo Limited. To find more things to do, where to stay, other places to visit, and more tourist information, refer to the Dubrovnik trip app . You can take a bus from Split to Dubrovnik in 3 hours. Other options are to drive; or fly. 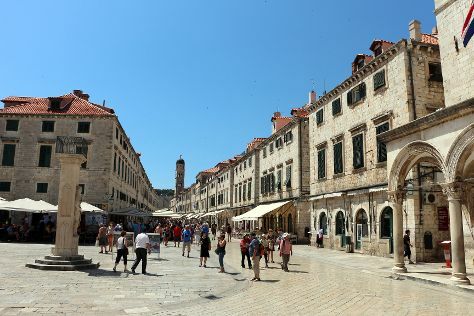 In September, daily temperatures in Dubrovnik can reach 29°C, while at night they dip to 20°C. Cap off your sightseeing on the 9th (Mon) early enough to go by car to Sarajevo. Kick off your visit on the 10th (Tue): take in the spiritual surroundings of Gazi Husrev-beg Mosque, then take in the local highlights with Walking tours, and then steep yourself in history at Bascarsija. Here are some ideas for day two: make a trip to Sarajevo War Tunnel, admire the striking features of Gradska vijecnica Sarajevo, contemplate the long history of Sebilj Brunnen (Fountain), get engrossed in the history at War Childhood Museum, then explore the world behind art at Galerija 11/07/95, and finally snap pictures at Latin Bridge. Plan a trip to Sarajevo easily and quickly by telling Inspirock to suggest an itinerary. Traveling by car from Dubrovnik to Sarajevo takes 4 hours. Alternatively, you can do a combination of car and train; or take a bus. In September, Sarajevo is little chillier than Dubrovnik - with highs of 26°C and lows of 11°C. Wrap up your sightseeing on the 11th (Wed) early enough to travel to Zagreb. Kick off your visit on the 12th (Thu): examine the collection at Museum of Broken Relationships, then take in the spiritual surroundings of St. Mark's Church (Crkva sv. Marka), then take in the local highlights with Walking tours, and finally test your team's savvy at popular escape rooms. To see photos, ratings, and other tourist information, you can read our Zagreb trip planner . Fly from Sarajevo to Zagreb in 2.5 hours. Alternatively, you can do a combination of flight and shuttle; or drive. In September, daytime highs in Zagreb are 25°C, while nighttime lows are 13°C. Cap off your sightseeing on the 12th (Thu) early enough to go by car to Ljubljana. Kick off your visit on the 13th (Fri): explore the historical opulence of Bled Castle (Blejski Grad) and then explore the activities along Lake Bled. On the next day, snap pictures at Tromostovje, then wander the streets of Ljubljana Old Town, then step into the grandiose world of Ljubljana Castle, and finally tour the pleasant surroundings at Tivoli Park. To see traveler tips, where to stay, and other tourist information, read our Ljubljana day trip planning site . Drive from Zagreb to Ljubljana in 1.5 hours. Alternatively, you can take a shuttle; or take a train. In September, plan for daily highs up to 23°C, and evening lows to 11°C. Finish up your sightseeing early on the 14th (Sat) so you can travel back home.